Conference season is upon me again, which means two things – less time to play Warhammer and more time waiting in airport lounges. So once again, I turn to the now sprawling array of licensed Warhammer games on iOS to get my fix. The Horus Heresy: Battle of Tallarn looks to be right up my alley – tank battles, Heresy-era gaming and turn based strategy. Brought to you by HexWar , Battle of Tallarn is about pretty much what it says on the tin – the dramatic battle between the loyalist forces of the Imperium and the Iron Warriors. At $2.99 Battle of Tallarn is on the inexpensive side, but we’ll get there in a bit. Almost entirely tank based (infantry do exist in limited forms), Battle of Tallarn is turn-based and takes place on nice, scenic hex maps that do an excellent job of conveying the ruined wasteland that is Tallarn post-Iron Warriors bombing. The campaign game is set up as a series of linked missions, following either the Loyalists or Traitors, though the missions will largely be the same, which was a little frustrating, as this causes it to suffer from the “It’s great that you utterly slaughtered the enemy offense, but someone snuck through! Retreat!”. There is no “Tallarn alternate history”. The game offers three modes – Casual, Standard and Hard, which both tune the AI and governs how much your forces rebuild between missions. In my experience Casual means the AI is dumber than a box of rocks and can often be foiled rather easily – in one mission simply by causing a traffic jam. The game does a good job at recreating some of the things about armored warfare in the Horus Heresy setting. The tank models themselves are excellent, and issues like armor facing are important to think about. But this is also where my first major problems with the game arises – Tallarn is a massive battle, and the armies involved in the game are quite small – usually less than a dozen tanks per side. I feel like the battle itself deserves a somewhat larger-scale view, especially when some of the more powerful units show up. Tank Choices: The primary early-game tank of the Imperial side is the Leman Russ Vanquisher – this makes perfect sense. Backed up with faster Centaur scouts and the odd Dracosian, this feels like a decently balanced force, and what you’d expect. Ironically, I did find myself favoring the standard Leman Russ over the Vanquisher for many missions, as the former’s splash damage was extremely useful. Even in video games my poor, beloved Vanquisher can’t get any love. On the Iron Warriors side, the backbone of your force is the autocannon armed Predator, which is entirely uninspiring, and incapable of damaging a Leman Russ from the front. To call this frustrating is a understatement, as it forces you to rely on the unreasonably good Contemptor Dreadnoughts in support to do almost all the heavy lifting. I feel like this was meant to force you to be clever and dynamic and go for side armor shots, but this really doesn’t come out in the game well. This does get better in later missions, but by then my enthusiasm was already on the wane. 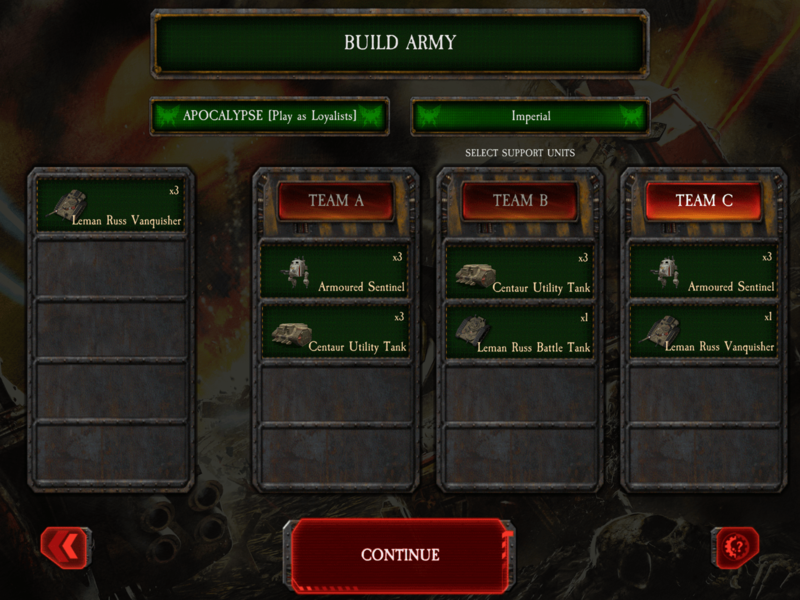 The game also provides you with the limited ability to tailor your support forces to suit how you’d prefer to play (shown below). Randomness: It feels really weird to be complaining about randomness on a blog about randomness in wargames, but that’s where we’re at right now. Battle of Tallarn is incredibly variable, to the point where it dramatically impacts gameplay. This mostly comes in with the ability of tanks to destroy things – there’s often either destroying your target or missing completely, often with not much in between. There are a large number of missions with very strict failure conditions – don’t lose any objectives, etc. Whether or not you’ve blown up a tank sitting on an objective then becomes the sole basis for whether or not you’ve won. Similarly, in the early Iron Warriors scenarios, the difficulty of many missions was “Did my Contemptors make it?”. If yes, they tore through the loyalists like butter. If no, I was pretty much sunk. 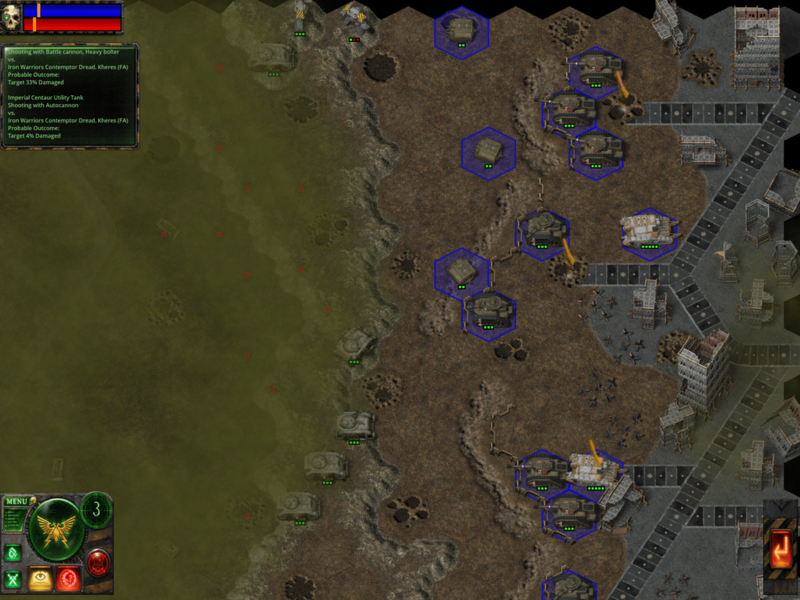 With damage carrying through between battles on the harder settings, this also impacts the campaign – in my experience the difference between an almost flawless victory and a badly mangled force was largely a function of randomness, rather than strategy. The campaign ends after six missions on both sides, with two additional campaigns capable of being unlocked for $0.99 each. Not a bad price for the campaigns, but when I reached the end of the intro campaign, I was already willing to move on. My overall feelings at this point? Battle of Tallarn has a great setting, and the makings of a good game, but it gets badly lost along the way. Enjoy what you read? Variance Hammer’s content is generously supported by our backers on Patreon.If you’d like more quantitatively driven thoughts on 40K and miniatures wargaming, and a hand in deciding what we cover, please consider joining them. For me, the biggest thrill about the game is being able to play a decent strategy title set in the Horus Heresy that isn’t an FTP nightmare. It *does* have that going for it.